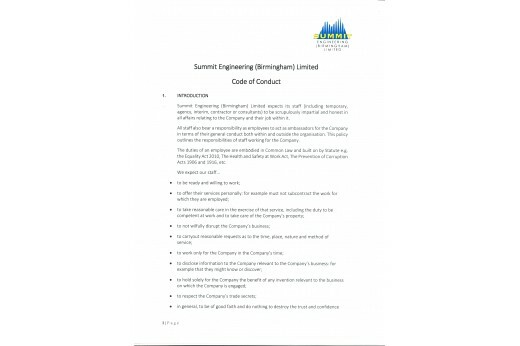 Summit Engineering (Birmingham) Limited expects its staff (including temporary, agency, interim, contractor or consultants) to be scrupulously impartial and honest in all affairs relating to the Company and their job within it. All staff also bear a responsibility as employees to act as ambassadors for the Company in terms of their general conduct both within and outside the organisation. This policy outlines the responsibilities of staff working for the Company. The duties of an employee are embodied in Common Law and built on by Statute e.g. the Equality Act 2010, The Health and Safety at Work Act, The Prevention of Corruption Acts 1906 and 1916, etc.